For a board, it may contain plated slot or unplated slot. Plated slot means this slot is plated with copper which can be used for electrical connection. 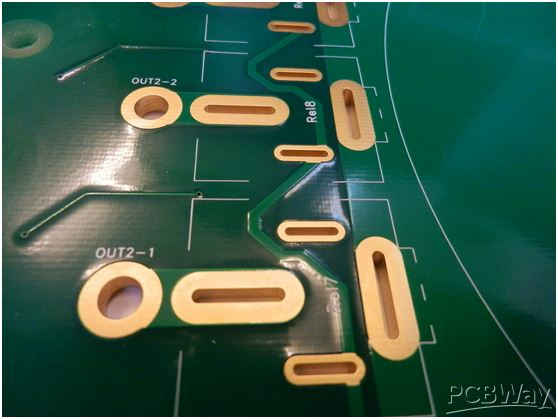 The min side of plated slot is 0.5mm for PCBWay. For unplated slot, the min size is 0.8mm width. If the through-plating is realized within the circuit board it is called plated-through slits, through-plating on the outer edge of the board is called sideplating. Basically, each milling with copper connections on TOP and BOTTOM will be produced as plated-through hole (PTH). Is a non-plated-through (NPTH) milling desired, the milling should be exempted from the copper. It is similar with plated holes . Milling the slots-copper sink-- surface finish (tin-plated for hasl , gold-plated for immersion gold).